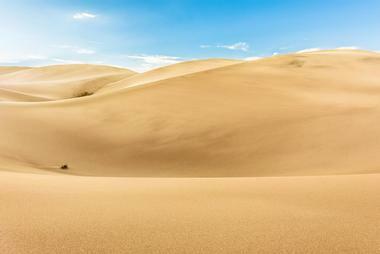 Visiting a monumental series of sand dunes in the heart of Colorado is an extraordinary experience. There’s no sea there, and it also doesn’t have the general kinds of facilities that will keep the masses entertained. But you’re guaranteed not to be disappointed in this utterly amazing place. As you look at a real, rollicking sand dune, you can understand the path of the wind, and the resonance between dry sand and waves of water. It’s an incredibly peaceful and beautiful place to visit, nearly all year round. 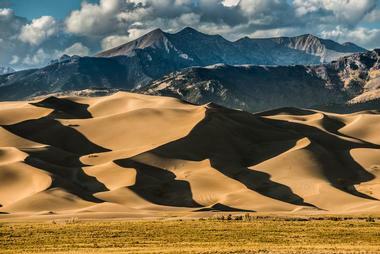 The Great Sand Dunes National Park and Preserve in Colorado is an enormous area. Its history of human habitation goes back some 11,000 years, and many of those so-called primitive communities coined some of the most poetic names for this vast tract of dune-filled land, from the Sand that Moves to Sandy Place Lake. But how did this extraordinary place come to be? Geologists have explained it as a product of the moving surface plates in the earth’s structure, which could have happened due to major earthquakes, millions of years ago, for instance. So what they think happened was the who range of the Sandre de Cristo mountains, which borders one side of the area, was moved – and this is proved by the presence of marine fossils high up in the rocks of these mountains. Millions of years ago, these rocks were under the sea. The San Juan Mountains, which is on the other side of the area, came about due to major volcanic activity, also several millions of years ago. The San Luis Valley, in between these two mountain ranges extends over an area of roughly 5,000 square miles, and with the shifting mountains, it became like a giant, enclosed basin. Many flash flood events and the like over time made this a very full and pressurized basin, a lake, if you will, which gradually, as the years passed, began to challenge its own walls. Extreme water pressure broke through the water-filled valley on its southern edge, allowing for the flow of rivers which most likely formed what is today the Rio Grande Gorge near New Mexico. As the lake in that basin between the mountains receded so did a vast area of sand sheet remain in its wake. So what is a sand sheet? 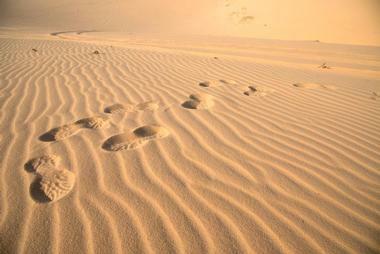 In simple terms, it’s an area defined by the fine sheet of sand which covers it. And while the thickness of the sandbank is not necessarily flimsy, it is the texture of the sand that is fine, like beach sand. In fact, it’s not very different from the kind of sediment you would find at the bottom of a lake, and the wind, funneled through the mountain ranges around it, shifted it, patterned it and molded it within the confines of the valley. 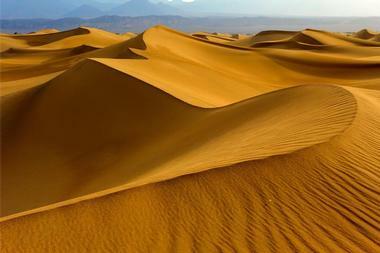 Sand dunes are curious things. In a sense, they almost feel like they are alive: they grow and subside with the wind, as they move and change shape over time. To all intents and purposes, the environments in which they exist are really hostile ones. Even so, communities began to opt to live there, taming aspects of the land and rising farms and in time, gold mines there from the first quarter of the 19th century. But in the 1930s, the resident communities began to worry that mining and building, particularly with concrete, which was happening in the region, could actually destroy the dunes. The people who had chosen to live there were rather proud of their beautiful landscape, and in 1932, a bill was ratified by President Hoover, to keep the terrain a national monument in perpetuity. This was the best news possible for the locals, but also for the many visitors to the area – some 285,000 still visit it, annually. With the frontage of a visitors’ center, the park itself steers away from allowing visitors the opportunity to litter or otherwise damage the area. You can camp in the area, but you do so at your own risks and there are a couple of restaurants and lodges in the outskirts of the vicinity, and also accommodation packages at nearly all the surrounding towns. And what is the biggest thrill of being in such an extraordinary landscape? Yes, rushing down a bank of sand with not a care in the world, but the first prize for many Sand Dune National Park and Preserve visitors is the night life of the place. Yes, you read that right. Statistics reveal that the experience of seeing the dunes at night is one of the central reasons why most people come there. Picture it. It’s really quiet. It’s fairly chilly. There’s not a lot of pollution. It’s the perfect context to lie on your back and glory in the mystical majesty of the stars and the moon. When you’re doing this, do it with sensitivity to the animals that live there. If you must use a flashlight, make sure it’s a red one. And don’t just think you can experience the beauty of the desert in the dark with your eyes alone. Open your ears and lungs, your heart and soul to the wisdom of the owls and the shuffle of the wind. Unlike many other activities in grand national parks all over the world, sand-boarding and sand sledding is not one of those that demands experienced credentials. But it does demand the correct tools. You need to get proper sand sleds – don’t expect to be taken on the wings of a sand dune, if you’re lying on a piece of hard plastic or a sheet of cardboard or even a conventional snow sled. It just won’t work and you will hurt yourself. Many of the surrounding lodges will hire out sand sleds or sand boards or sand skis – find out before you invest in them. And as you will discover, wind and sand are not toys to be played with. They seem to have minds of their own, and they’re much bigger than you. Be careful of dune collapses and also keep an eye out for the temperature of the sand. In the desert, you can’t remember your name, the rock band America sang in 1971, which might be true, but do remember your respect for the weather. If you’re traveling into this area in order to take photographs, it’s an idea space, and you will see formations and textures and patterning that you cannot believe have been implemented by the forces of nature. As always, check on weather forecasts so that you don’t find yourself and your camera holed up somewhere in the face of strong winds, by accident. It’s a myth that there are venomous snakes on the dunes. There are rattlesnakes but they will know you’re there long before you know they’re there – and they’ll probably be more afraid of you, than you are, of them. Be careful of driving into large horned animals such as moose at night – the area is not lit and these wild creatures are not road-savvy. You don’t want to come a cropper with an animal in the wild, ever. In a world of shifting sands, they say a desert is a place without expectation, but it’s never a foolish idea to check on the weather before you reach your destination. Lightning is really prevalent in the area: if you hear rumblings of thunder, get out of the way of a storm as quickly as you can. 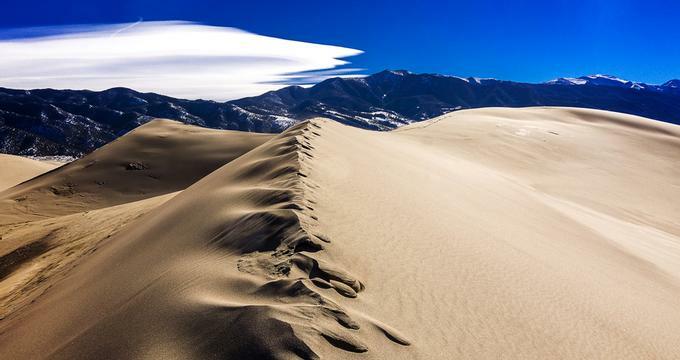 While there are several campgrounds set up in the Sand Dune National Park of Colorado, it’s not recommended by some of them that you visit there in the winter months, from November until March. If you’re driving in the area, you need to be driving a high-clearance vehicle, with a four wheel drive and big tires, to make sure your vehicle keeps its grip on the sand. With nominal entrance fees which all go to the upkeep of the park, you can afford to spend your money on all the correct equipment for such a trip. There’s a visitors’ center in the area which is a brilliant repository for everything you might need, from information and expert advice to books, potable water to the correct shoes which you need to navigate the sand. And there are a range of permits, and fee waivers too, that you might qualify for. 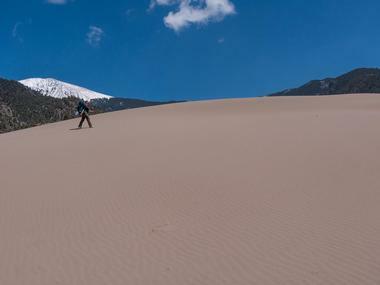 While you’re planning your Great Sand Dunes trip, make sure that you factor all the activities you want to take part in, whether you are planning to backpack with your friends, bring school children into the area or do serious research, so that you can get all the paperwork done at the outset.